Can you imagine how your teeth would look and feel if you didn't brush regularly, or at all? Tartar would build up on the visible surfaces of your teeth and potentially extend below the gum line causing gum infection or gingivitis. The infection could grow to affect the root and bony socket, causing periodontal disease. The same process can affect cats and dogs. In fact, it is estimated that 85% of all dogs and 70% of all cats over 3 years old have some degree of periodontal disease. In the early stage of the disease, many pets may show no symptoms, but as the disease progresses, animals may develop bad breath, bleeding gums, poor appetite, and signs of pain. Eventually bacteria in the mouth can spread through the bloodstream to the rest of the body. 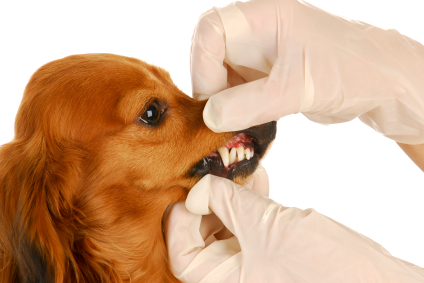 A professional dental cleaning by your veterinarian is a key component in keeping your pet healthy. Additionally, brushing your pet's teeth regularly can combat tartar and plaque buildup.